Lost in the excitement of the returning stars and the hope of stars to come is the quiet backbone of any football team. For the most part, these are the guys who didn’t grab the headlines their freshman years. They’ve been in the program for a year or two or three, possibly redshirting, biding their time behind established starters, working their way up ladders that may or may not lead to a high enough top rung. These are the team players — those who, after the initial excitement of the recruiting class, fade into obscurity, possibly to emerge as stars for a year or two before moving on to whatever comes next. Players from the past three recruiting classes who wait are the subject of this week’s Three-and-Out. 1. Recruiting Class of 2014. A year ago there were a number of players the Ducks were excited to have join the ranks who have, for the time, faded into the woodwork. But really, who should we be more excited about this time of year: high school kids who have yet to prove that they can survive away from home, or those finishing their first year of college working with the Ducks’ program and preparing to shed their redshirts? Jimmie Swain (# 18) got playing time as a true freshman. The Recruiting Class of 2014 has some intriguing possibilities that we have yet to see, starting with 4-star quarterback Morgan Mahalak. But Mahalak isn’t even the only 4-start recruit from this group that we have yet to see in action. Jalen Brown, a 6’2″ wide receiver who has 4.5 40 speed and received offers from 26 schools covering all five power conferences, is also waiting in the wings, along with RB Tony James, a 5’9″ 175 pound speedster who could conceivably end up playing a different position due to the embarrassment of riches at the RB position. Want bulk on the offensive line? Redshirt freshman Braden Eggert, at last report, has grown to 6’6″ 320 pounds, and he’s had a year working in the system. For depth on defense, 6’1″ DB Khalil Oliver, while only given two stars by Rivals.com, impressed during August training, as did fellow DB Glen Ihenacho and LB Jimmie Swain. While it is unlikely that any will start in 2015, they contribute to team depth and may well work their ways into the two-deep in the near future. 2. Recruiting Class of 2013. This recruiting class demonstrates clearly why some excitement should be reserved for a year or more rather than spent on the guy who’s making us guess which hat he’s going to put on live from his high school gym. 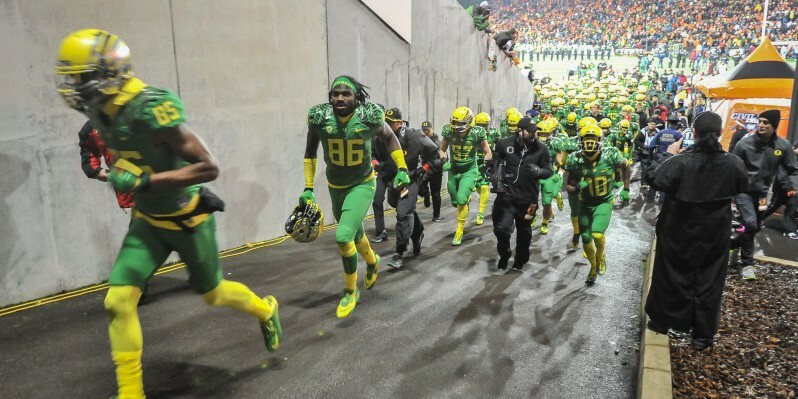 Consider the impact that Doug Brenner, Danny Mattingly, Evan Voeller and Juwaan Williams could have on the 2015 Ducks. All four redshirted their freshman year. With injuries to the offensive line during 2014, Brenner and Voeller picked up valuable playing time. They also used their redshirt year to pick up some bulk, Brenner from 275 pounds to 305, and Voeller from 285 to 295. Now going into their third year in the program, both are positioned to contribute much more than the average four-star eighteen-year-old. Redshirt freshman Danny Mattingly (#46 on left) closes in to assist on a tackle. After redshirting in 2013, Juwaan Williams saw increasing action in 2014. From his DB position he was credited with 15 tackles, including four against Utah and one in the Rose Bowl against Florida State. Mattingly impressed the coaches with his scout team play in 2013 so much that they were tempted to burn his redshirt. But they resisted and the 6’5″ 235 pound linebacker saw increasing action during 2014, finishing with 19 tackles and one interception — the interception coming in the National Championship Game. He appears on course for an absolute breakout season. 3. Recruiting Class of 2012. 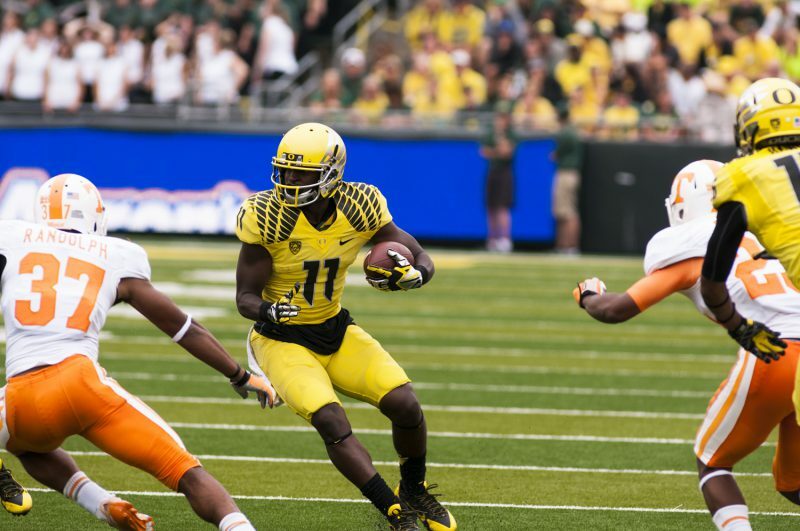 Because Bralon Addison missed the 2014 season due to injury, he is not counted as a returning starter. 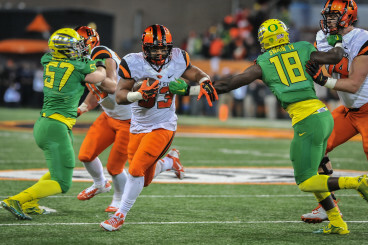 Nonetheless, in 2013 he caught 61 passes for 890 yards and 7 touchdowns and made Honorable Mention All Pac-12. The Ducks look forward to the return of Bralon Addison. Though this is a recruiting class that has been hit fairly hard with dropouts and transfers, it does include a handful of returning starters (WR/RB Byron Marshall, DLs Alex Balducci and DeForest Buckner, DB Reggie Daniels and WR Dwayne Stanford), two who have already left for the NFL (Kyle Long and Arik Armstead), one battling to return from injury (Pharaoh Brown) and a few still working to make their marks. 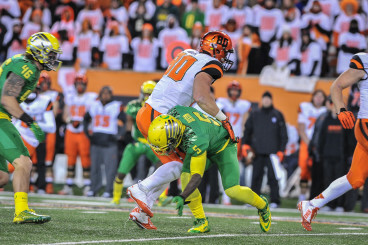 JC transfer Stetzon Bair, the tallest of the Ducks at 6’9″ and 290 pounds, has bounced back and forth between D-line and O-line. Now going into his final season, it’s unlikely he will ever start, but he provides leadership and depth. LB Cody Carriger has seen limited action here and there. He’s tall (6’6″) and fast (11.47 100 meters in high school), but will need a breakout season to work his way into the two-deep. Terrence (T.J.) Daniel was recruited as a tight end, but redshirted in 2013 to make the adjustments to convert to defensive end. During his redshirt season he was named defensive team scout player of the year. He saw significant playing time in 2014 and got in on 14 tackles. For the most part, these aren’t household names. Some of them never will be, but unlike those who fax in their signatures this week, all of them have at least seen the big stage and have dealt with the struggle of balancing athletic and academic demands while away from home for the first time. They have paid their dues. And chances are that, collectively, their contribution to the 2015 Ducks will be greater than those who pique our excitement with their signing day faxes.